Jimmy Carter, still flapping his (false) gums. Former president Jimmy Carter, one of the few U.S. officials who has traveled to North Korea and met with its leaders, expresses hope for the planned White House summit with Pyongyang but warns that President Trump may have made “one of the worst mistakes” of his tenure by naming John Bolton to the sensitive post of national security adviser. 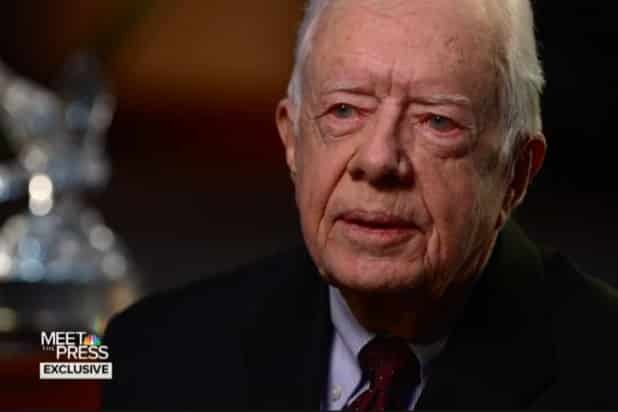 In an exclusive interview with USA TODAY, pegged to the publication of his new book titled Faith, Carter calls Bolton “a warlike figure” who backs policies the former president calls catastrophic. I wonder how much of a disaster for the country – say, Hurricane Katrina levels of disaster or something even worse, like Jimmy Carter?